Accommodate bikers with this economically priced bike rack. Compact and practical, it is perfect for store front or home use. This bike rack comfortably parks up to six bikes, three on each side. The Space Saver bike rack is constructed of 1-1/4" O.D. steel tubing with 3/4" O.D. welded vertical spacers and comes in galvanized or powder-coated finish options. Optional concrete anchor kit includes eight galvanized expansion bolts and four pipe brackets. 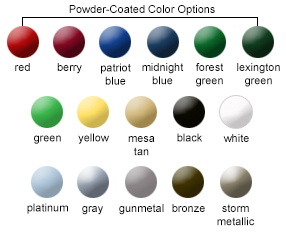 Big savings on black powder-coated bike racks in comparison to other colors.